Fun fact about me: I hate failure. Obviously nobody likes it much, but it seriously grates at me. As a perfectionist with OCD, I can’t stand when things don’t work out correctly. Failure is like a festering wound into which I keep pouring salt in the form of continually obsessing about what went wrong and why things didn’t turn out perfectly. I feel the compulsive need to fix my problem, to make it right. Bear that in mind as I spin the following tail of woe. On Wednesday evening, my family had a little get-together because my darling baby sister is going away to college in a few days, and we wanted to send her off properly. I found myself in charge of providing sustenance in the form of desserts of my sister’s choosing. 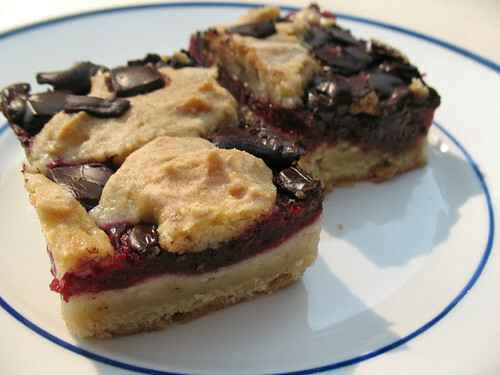 First she decided that the Raspberry-Chocolate Chip Blondie Bars from Vegan with a Vengeance sounded mighty fine, so that went on the list, and after procuring a few choice items, we threw together the blondies with no problem. They came out perfectly; the Lindt dark chocolate bits we used in place of chocolate chips contrasted most deliciously with the raspberry filling. These were a huge hit – and they didn’t look too shabby, either. Tantalizing, no? But we had to make something else, because a proper dessert gathering is all about having options. So, after much hemming and hawing, Sister Dearest decided she wanted something lemony. A lemon cake, perhaps. Oh, the horror! I’m exaggerating, though; the baking of this cake was fraught with adversity and halfway through I knew with dreadful certainty that no good would come of it. First, my poor, helpful, little sister zested her finger instead of a lemon and was out of commission. Next, because of my local grocery stores’ lack of plain or even vanilla non-dairy yogurt, I had to resort to this “recipe” instead. 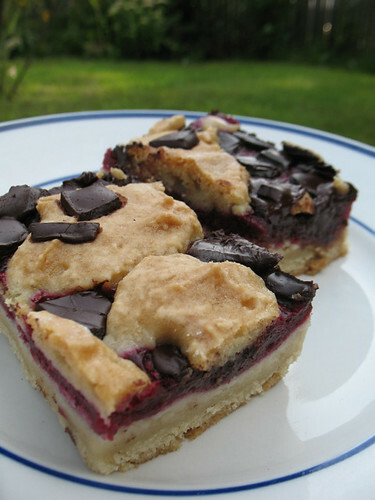 * I’d used it successfully in the blondies, and it never fails in the muffins from Vegan Brunch I’ve made a few times, but I think that for this cake recipe, it’s just not right. Because I sort of eyeball the amount of cornstarch, I often tend to add a little too much, thus creating a quite thick “yogurt.” I also sometimes neglect to add the splash of lemon juice or vinegar the recipe includes, which in this case was a punch in the gut since I had lemons right there – this is, after all, a lemon cake. Then, because the soy yogurt was so thick, my cake batter was very, very thick. So I added a few squeezes of lemon juice (I was replacing the lemon extract with extra zest, by the by) and a dash of soy milk, and had to keep stirring to mix everything together. Only after I had thoroughly stirred my batter did I notice Celine’s note to “stir until just combined;” it was then that a 1000-watt lightbulb flashed on in my brain and I realized that this was a delicate cake, one that required a light touch and definitely not extra mixing. Presentiments of failure began to stir in my head at this point, but I pushed them aside for the time. The final piece of kindling in this fire of failure was my lack of a 6″ x 4″ round cake pan; we only have the small 9″ x 1″ ones, so after doing some hasty math, my sister and I thought we might just make two of those size and layer them. But by the time I halved my batter and poured it into the two pans, it was too late to save the cakes. A few minutes in the oven revealed that they were obstinately refusing to rise; I’d overmixed them and allowed the flour to glutenize. And the shallower pans surely didn’t help matters; in retrospect, after seeing how little they’d risen, I realized that just one 9″ x 1″ pan would’ve worked fine. 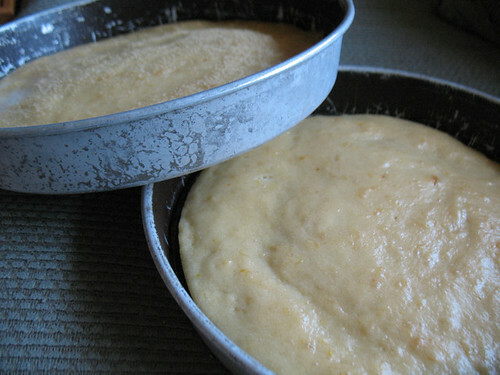 Anyway, 25 minutes later, I ended up with two very, very flat lemon cakes… they were more like pancakes, really. I felt irritated with myself because the failure was my fault; I should have intuited what sort of cake this was and not taken it for granted. There was no way I could show these cakes to my family the following night, but by then it was too late to do anything; I’d have to wait until the following day. I went to bed, and visions of tiny, mocking lemon cakes danced in my head. I awoke the next morning with a few possible solutions. I could save the cakes for “personal eating” and make something totally new, or I could try again and work to perfect the same cakes. But neither of those possibilities satisfied the frugal penny-pincher that lives inside of me; it seemed like a waste to make something entirely new. So I decided that if the cakes at least tasted okay, they might be salvageable. A tiny taste revealed to me that – hallelujah! – despite their refusal to rise and dense appearance, the cakes still tasted mighty fine! The way was clear for a salvaging mission. 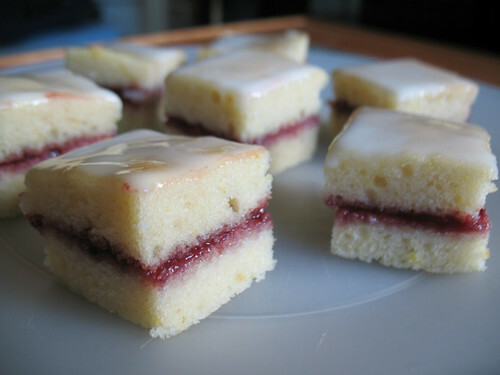 After a little quick thinking, I decided to stack the cakes and make mock-petit fours with a layer of raspberry jam in the middle, thus turning VeggaSis’s going-away gathering into a vaguely raspberry-themed event. I covered my faux petit fours with a simple glaze, and guess what? They didn’t turn out half bad. I’ll leave you with another gratuitous blondie shot, because these babies were amazing. My one tiny criticism of the recipe is that the actual blondie layer is much more cake-like than blondie-esque, even if the flavor is spot-on. I might tinker with it some day and try to give it a denser, chewier texture. But even if I don’t, I’m definitely adding this recipe to my arsenal of no-fail favorites! * I found this recipe while Googling for a quick homemade soy yogurt recipe, and I do believe that this must be an older blog of Celine’s, which I didn’t realize until now. Interesting! it all depends on the quantity of yogurt you want to sub that formula for. if it’s 1/4 cup, okay, if it’s about 1 cup, it’s likely to cause trouble. and since it’s a formula, it’s usually best to measure carefully. Wow those desserts look awesome! I love how you salvaged the lemon cakes, good thinking!